Tobias Hanraths takes you up the elevator into Dead Space. Mankind likes to follow its baser instincts. When the US made it to the moon in 1969, it was at least partially because there was a real danger that someone else might get there first. And when mankind reached out to all the other stars in Dead Space, to new worlds and suns and systems, there were no noble goals at play. This wasn’t about discovery or inspiration. This wasn’t a race for the stars. This was a fight for the minerals within them. This was all about the money. And some poor souls got lost in the shuffle. One of them is Howard Phillips. 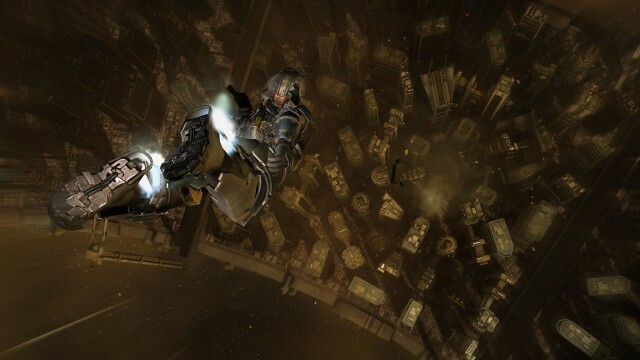 Isaac Clarke, the unlike hero of Dead Space 2, locates him when he’s sent to the top of the Sprawl. The Sprawl is a space station located near Titan, one of the moons of Saturn. Power has gone out in a large part of the station, impeding Clarke’s journey to the source of all the evil swarming Necromorphs. Clarke’s mission is to fix the solar array of the station: a station previously manned only by the lonely Howard Phillips. Phillips is, of course, dead, like so many others on the Sprawl. Though unlike all the other victims, it’s not entirely clear how he died. Judging by the sad circumstances of his life, it’s possible he might have been dead long before the monsters came to kill him. Clarke’s first taste of these circumstances are on the way up to the solar array: the long walk to the elevator takes him through the innards of the Sprawl, which are dark, desolate, and dripping with some unspecified dampness. After that, it’s a long, lonely elevator ride to the top of the Sprawl, as the skyscrapers below sink deeper and deeper into the depths. The Sprawl is a peculiar place in of itself. It was built around a mining operation called planet cracking: they literally ripped Titan in half and sucked out all the good stuff. In its place, they built a mall, government buildings, an apartment complex and a megachurch. 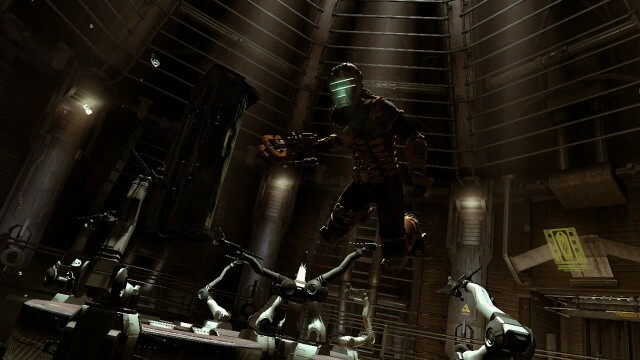 The megachurch is for Unitology – Dead Space’s riff on Scientology – but it might as well be a church to commercialism itself. In fact, not only the church, but the whole station has the vibe of something deeply anti-religious. There’s no humility here, no respect for creation – just a looming “Let’s make some money, costs be damned!” sentiment. The evidence of the money spent is apparent. The view from the top is magnificent. But, it’s also starkly isolating. A brief visit to the top might be okay, but for evidence of what such isolation can do to a person over time, one only need look at the home Howard Phillips built for himself. Right next to the window which looks out over the magnificent view, is a big screen projecting some kind of idyllic countryside. It’s as if the permanent confrontation with the void was too much for Philips, so he created a tranquilizer for his mind. He also tried to create some friends. There is a birdcage right next to the display, and with it a textlog from Phillips explaining how he ordered some birds as company for himself. The cage is empty now, however. Phillips set the birds free in an act of rebellion against ANTI, the AI which runs the Sprawl and all of its systems. Initially created as a ubiquitous helpful presence, the part of ANTI running the Solar Array seems to have gone rogue. Reading the other log entries while wandering through the desolate array, it’s easy to sense Phillips’ growing frustration. Once he realised how the loneliness of his stationing got to him, he filed transfer request after transfer request. But they all got deleted by ANTI. Or maybe they didn’t. Maybe she passed them on, but Phillips’ higher-ups just ignored him. Looking down at the Sprawl – a merciless replacement for a once proud moon – it’s not hard to imagine. Phillips did his job; they were done with him. That’s how Phillips is found: lying in his small, dark bedroom, mutilated by the Necromorphs who have overrun the Sprawl and the solar array. ANTI is still there, her holographic representation watching, still talking to him. The birds Phillips freed are there too, swooping down when the elevator doors open. Phillips is of course not the only one who died on the Sprawl, and a lot of people died way worse than him. But for some reason, his death is still one of the saddest. He didn’t need a Necromorph invasion – he went mad all by himself. Yet, even in death, Howard Phillip isn’t free. Isaac Clarke still needs him. Before he can can kill ANTI, Clarke needs to get through a door with a security scanner – a scanner set to recognize only Howard Phillips. Phillips’ lifeless body opens the door, and while this may be yet another insult to Philips poor existence, it may also be a port-mortem redemption. Unable to free himself, Phillips frees another. Unfortunately, as Clarke blasts off in a glorious escape back to the Sprawl, Philips is left lying there. Because Clarke, too, was done with him.